Peanut butter and jelly. Macaroni and cheese. Dark chocolate and port. Anything and bacon. There are some classic food combinations that just work. Sushi and tater tots have not previously been on that list in my mind, but I'm ready to be convinced. And now Sticky Rice is ready to do the convincing. As reported by THE source for all things on and around H Street, FrozenTropics, the Washington outpost of the popular Richmond institution is just about ready to open its door. Though they are waiting on a few final details, they fully anticipate being open for business next week. I had the chance to talk with the guys who will be running the show up here in Washington, and they took the time to tell me a bit about what D.C. foodies can expect at this eclectic eatery. For those who are unfamiliar with Sticky Rice, the concept can best be described as "Asian-fusion," but that's only the tip of the iceberg. The menu at Sticky Rice includes a wide range of sashimi and sushi (nigiri and rolls) as well as several noodle-based dishes that can be ordered with beef, chicken, seafood or tofu. 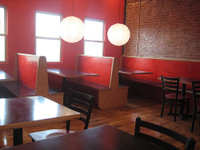 But they are not limited to the typical fusion offerings - a half-dozen sandwiches are available, as are appetizers including the hyped "bucket of tots" that is ready and waiting for late-night crowds coming from the Rock n' Roll Hotel, the Red & the Black and even the Atlas Theater. Check out their website for a better idea of their menu, and while you're there be sure to notice just how much of it is Vegetarian and Vegan-friendly. Quite a few of their menu items are inherently suited to Vegetarian diets (and noted as such on the menu), and even more of them can be easily modified to accommodate. Unlike quite a few Asian-focused restaurants, Sticky Rice intends to offer a wide selection of suitable beers and wines, in addition to a hand-selected range of sakes that reflects the various styles that are available. And because they recognize that many people aren't as familiar with sake as they are with other beverages, they plan to offer bi-monthly or monthly sake dinners that will feature different styles of sake paired with complementary dishes. NO IMITATION CRABMEAT - Though this is almost an unheard of practice among sushi purveyors in Washington, Sticky Rice will use 100% genuine crab in all of its sushi. Although this results in a $5 California Roll, it definitely sets them apart from the competition. Weekly specials will cover all courses - In other words, look for a sushi special, an appetizer special, an entree special, a sandwich special, etc. each week. A Late Night 'Fry' Menu - Although the full menu will not be available, Sticky Rice will remain open until 2 AM Sunday through Thursday and 3 AM Friday and Saturday. 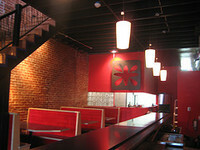 Once the main kitchen closes, a fry menu will feature tater tots, sticky balls, garden balls and other fried goodness. Experienced chefs from the start - Four of the chefs from the Richmond Sticky Rice will be coming up to Washington for two months to make sure that the new kitchen delivers the way the original does. 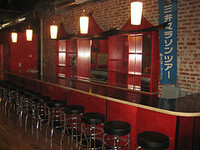 Nightly events including "Sushi Heaven" on Mondays (half-priced sushi from 10:30 to 12:30 PM), Karaoke on Tuesday, Blingo (speed bingo) on Thursdays and trivia nights on Sundays. 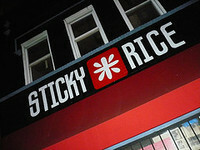 Sticky Rice has seating capacity for roughly 100 people on two levels and an outdoor seating area on the second floor. They will open from 5 PM every night, though the kitchen hours will vary from night to night.